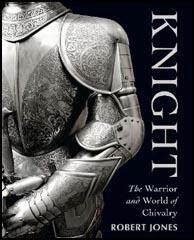 A knight was a mounted soldier who performed military service for a nobleman. A man was created a knight by being dubbed (struck on both shoulders with a sword). This was a ceremony that was usually performed in church. 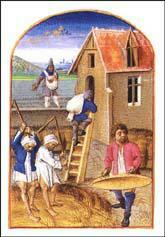 In return for a grant of land or money, the knight did military service for his lord on a set number of days. To go into battle a knight needed a horse, a shield, a lance, a sword and a hauberk. The knight also wore a conical helmet that had a nose guard for further protection against blows to the face. 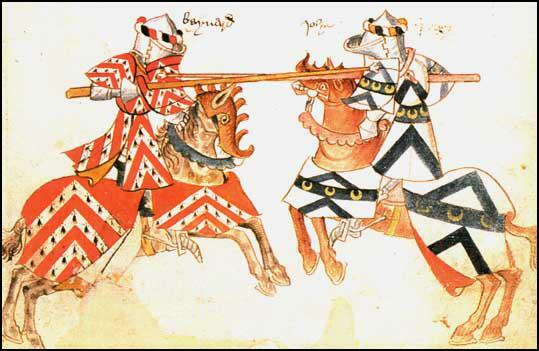 Norman knights also used spurs and stirrups. Spurs were used to drive the horse forward in battle. Stirrups enabled the knight to keep his legs straight during battle. This held him securely in place while delivering or receiving blows. The of knights and military service was established in England by William the Conqueror. During the reign of Henry II had 6,000 knights. These men served in his army without pay, for 40 days a year. The Count of Flanders caused a quintain to be set up in the market place. This quintain was a strong shield firmly hung to a post. 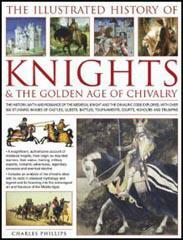 On it, those who wanted to be knights and strong young men might practice warlike sports. They rode at it at full gallop, and tried their strength, either by breaking their lances, or by piercing through the shield. When the realm is threatened or attacked by enemies, the king orders that a certain sum, usually one pound, shall be paid by each knight, and from this source are derived the soldiers' wages. For King Henry prefers to expose foreign mercenaries rather than his native knights to the fortunes of war. Earl Warenne was called before the king's judges. The judges asked to see his warrant (documents that proved that he owned his land)... he produced an ancient and rusty sword and said: "Look at this, my lords, this is my warrant! For my ancestors came with William and conquered their lands with the sword, and by the sword I will defend them from anyone intending to seize them. The king did not conquer and subject the land by himself, but our forebears were sharers and partners with him." With curly locks, as if they had been pressed. He was some twenty years of age, I guessed. With wonderful agility and strength. He knew the way to sit a horse and ride. Knew how to joust and dance, to draw and write.